People usually visit museums and exhibitions in groups, with family, friends, and in school groups. Unfortunately, social cohesion within groups is lost with the classic audio guides currently in use. The Museum App, which I developed as part of my Master’s thesis, makes an exhibition visit into a shared experience. The web app is part of a client‐server‐system that can be installed at exhibitions, ensuring synchronous interaction. The project was supervised by Christian Riekhoff and Dr Joachim Quantz, both of ART+COM Studios. 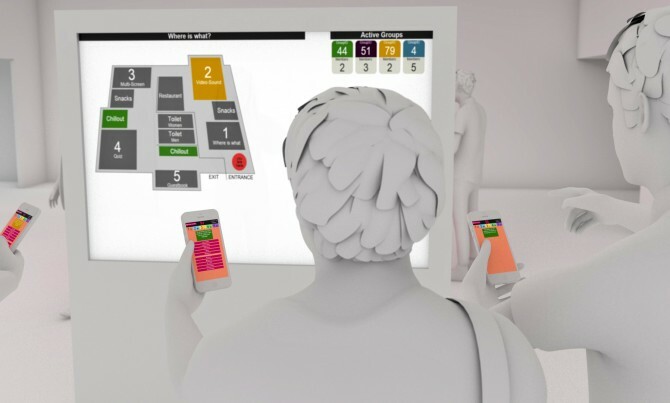 On entering the exhibition, visitors log in to the wireless network on their mobile devices and are automatically redirected to Museum App, which shows all content in whichever language was detected. The group is invited to choose an administrator, who then creates a virtual group with a unique group ID and a group colour. Once everyone has joined the group, the administrator can start the tour. There are currently five menu items to choose from that will offer the group added value in terms of playful learning and additional information. An exhibition map displayed on a large screen in the entrance area shows all active groups, including the number of members in each. The group can organise their tour by choosing exhibits on their mobile device, and as exhibits are selected, the group’s colour flashes on the large map at the same location. The choices of the group may prompt other visitors to look at the selected exhibits as well. 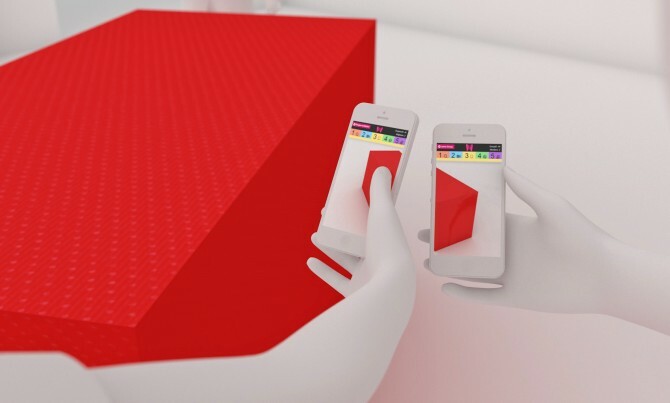 In contrast to a classic audio guide, Museum App plays audio to all group members synchronously, e.g., while watching a video displayed without sound in the exhibition. The group is pushed to exchange information on exhibits though the way information is received. Administrators, for example, receive only images while members get the respective text. Another feature offers each member a mosaic piece of an image. In order to see the whole picture, the group members must bring their mobile devices together. Groups can play the museum quiz together. 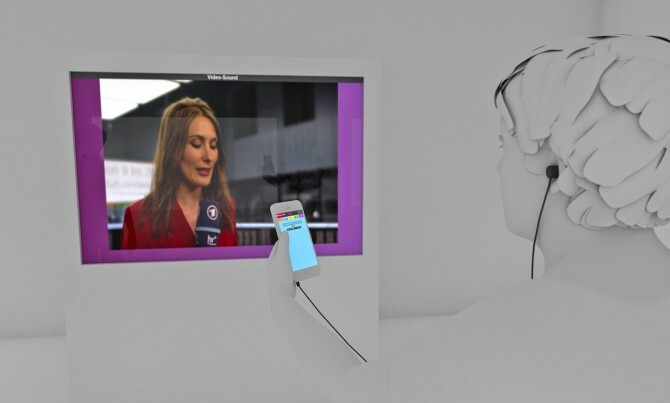 Questions are displayed with the possible answers on both a big screen and on mobile devices. If a majority of members answers correctly, the group gets a point. The groups’ score can be saved to a high‐score list after all questions have been answered. At the exit the visitors encounter the virtual guestbook on another big screen. Using their devices, they can type feedback and click on send or make a throw gesture to make the comment appear on the screen along with an avatar (gravatar.com).